If you use Listrak for marketing emails, you can now send loyalty program related emails through your Listrak account instead of through Zinrelo. By integrating Zinrelo and your Listrak account, you can manage unsubscribes in a single place and leverage Listrak's capabilities to set up workflows for better customer engagement. This article explains the steps you need to take to integrate Zinrelo and Listrak. Note: When you enable the Listrak integration, Zinrelo will no longer send out email notifications. So the integration should be enabled only when you are ready to setup the email templates in Listrak. Login to your Listrak account and navigate to Manage >> Integrations. Click on the 'Add New Integration' button and choose the 'Email API' integration and then click on 'Setup Integration. Give a name to your integration such as 'Zinrelo Integration'. Contact support@zinrelo.com to get a list of IP addresses that you will have to whitelist in Listrak. Note the Client ID and Client Secret that are generated. Note: The client secret is displayed only once. If you have not noted it, you will have to redo the integration. Login to your Zinrelo account and navigate to Settings >> Apps >> Listrak. Update the Client ID and Client Secret generated in the previous step in Zinrelo. A list by the name 'Zinrelo Loyalty List' is automatically created in Listrak. 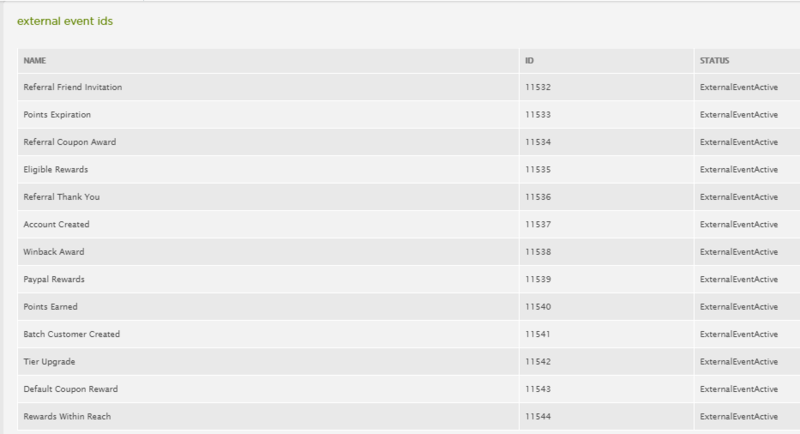 This can be viewed by navigating to Manage >> Lists >> List Manager. 2. External Event IDs are created in Listrak. These events are the triggers from Zinrelo which you can use to send out program related emails. To view these events navigate to Support >> API >> API ID information. 3. New fields are created for users in Listrak. These fields can be viewed just below the external events that are created. Whenever the user details are updated in Zinrelo they will automatically be updated in Listrak. The integration does not automatically update historical data for users in Zinrelo. 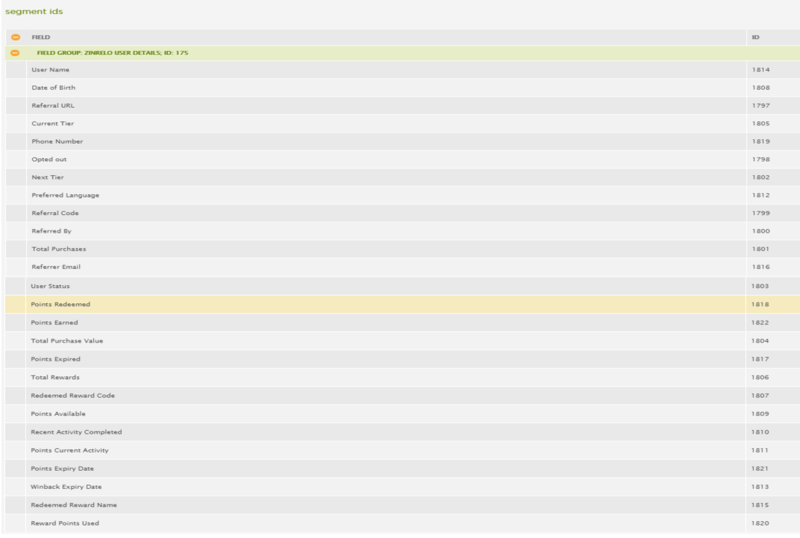 So for the first sync, export the members data from Zinrelo and manually update it in the Listrak list. Note: When you update the access token, Zinrelo emails will be disabled. Be prepared to configure the emails through Listrak when this switch is made. You can use Listrak conversations to send emails based on triggers from Zinrelo. To set up an automated email, create a new conversation and give it a easily identifiable name. Click on the 'Trigger' node and the list of external events will be displayed. Select the appropriate event for that email. 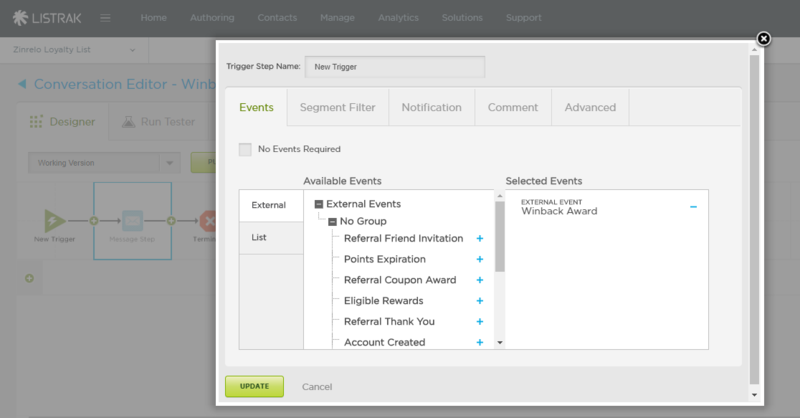 For example, if you want to set up the email that is sent to customers who are identified for the 'Winback' campaign, you will use the event 'Winback Award'. Configure the email message that you want to send and then publish the conversation. You can create more detailed workflows in Listrak to send separate emails to members of different tiers for the same action. To notify members about available rewards, you can create parallel flows for the same action based on the available points of the member. (Available points will determine which rewards the member will be eligible for). Now that you know how to send out loyalty program emails through Listrak, here is a list of emails we recommend setting up. Email to members soliciting referrals: Periodically, you can solicit referrals from your customers by asking them to share their unique referral link with friends. To update the referral link in emails, you can use the Referral URL field in the Listrak email template. Email Invitation to Friends: Members can also refer friends through the refer-a-friend activity in the loyalty dashboard. In these cases, they have an option to update their friend email addresses in the dashboard and an email is supposed to be sent to the friend on behalf of the member. To set this up, you can create a workflow that listens to the Referral Friend Invitation event and sends out the invitation email to the friend from Listrak.The invitation email template can reference the referrer details through the fields 'Referred by' and 'Referrer Email'. Rewards reminder: It is always a good idea to remind members about the rewards that they are eligible for. Zinrelo will trigger the event 'Eligible Rewards' once a month for all customers who are eligible for any of the rewards in the program. You can either use this trigger or set up your own workflows that remind customers from time to time about the rewards that they are eligible for. Note: The exact list of rewards for each customer will not be available in Listrak. So you may have to setup multiple filter conditions based on the available points to decide which email is sent to the customer. For example, if a customer has 1400 available points, the email should only show the rewards that are available for lesser than 1400 points. 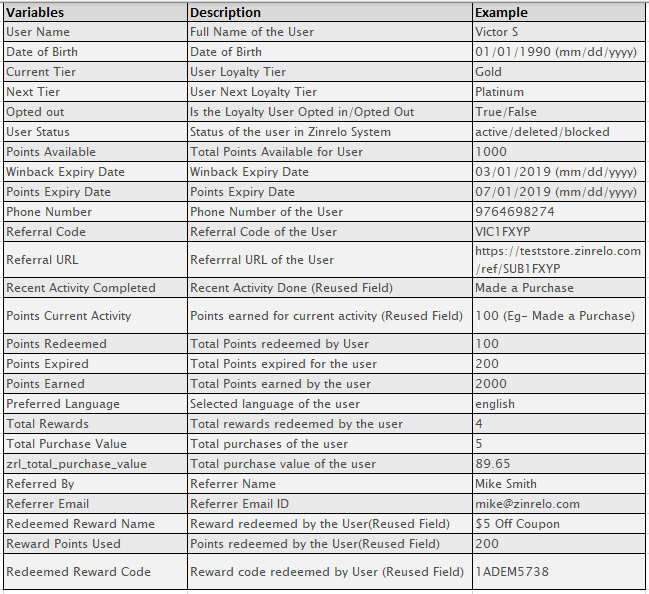 Whenever the reward structure in Zinrelo is updated, the email filters will have to be updated as well. 'Redeemed Reward Code' to show the coupon code issued. Points earned email: Whenever members earn points for any activity, Zinrelo will trigger the 'Points Earned' event. The email template can use the following variables. 'Recent Activity Completed' to show the activity for which points were earned. 'Points Available' to show available points. 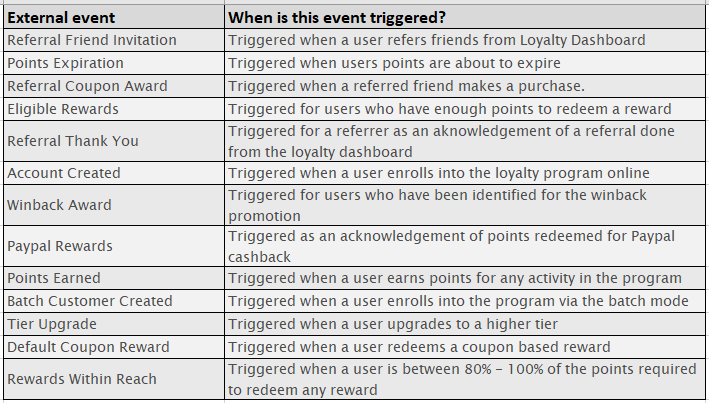 Based on the available points if eligible rewards can be communicated in the same email, the engagement will be higher. Points expiration: Based on the expiration settings in Zinrelo, Zinrelo will trigger the 'Points Expiration' event. Members can be notified about the approaching expiry date by using the variable 'Points Expiry Date'. This date is always in the UTC timezone. Win-back email: Zinrelo has a built-in win-back activity, where inactive members are identified and a win-back offer is rolled out to them. The trigger to send out the email is the 'Winback Award' event. The win-back offer usually is a fixed number of bonus points and the offer has a limited validity. To communicate the date till which the offer is valid use the variable 'Winback Expiry Date'. Tier upgrade email: Whenever members move up to a higher tier, Zinrelo will trigger the event 'Tier Upgrade'. Let the members know the benefits that they have unlocked as part of the higher tier. The workflow should include a separate email for each tier. The user tier can be checked in the filters using the field 'Current Tier'. At the time of upgrade this field will be updated to the new tier.